The Polyforum Siqueiros is venue of different types of activities, ranging from cultural to political and social, as it has different stages that can host them: The Universal Forum, The Space for Emerging Art, a Theater, a shop and administrative offices. This place is museum itself. Its construction lasted from 1966 to 1971. 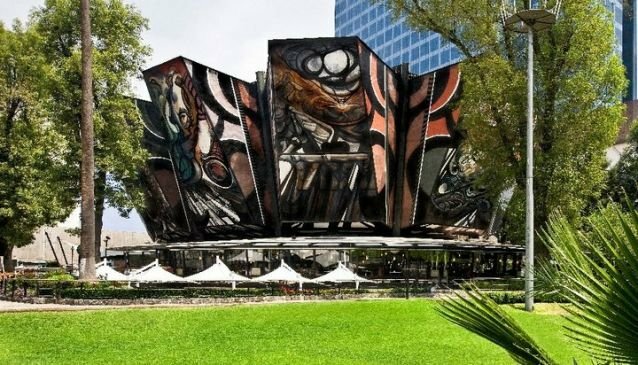 It has 12 exterior panels with paintings of muralist David Alfaro Siqueiros, one of the most prominent Mexican artists of the 20th Century. Inside, it has another massive mural called 'The walk of mankind'. This is the most important painting of Master Siqueiros, representing the evolution of consciousness of freedom and justice in Latin America. In total, the building has 8,700 square meters of murals, making it the biggest mural of the world and one of the most representative masterpieces of Mexican muralism.